VPTc10-28 EMI Filter | VPT, Inc. 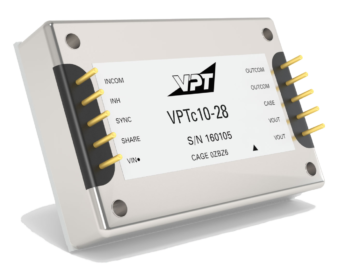 The VPTc10-28 Series EMI filter and transient suppression module combines two functions in one space-saving package. Reduce the reflected noise of DC-DC converters while simultaneously protecting your power system from inrush current damage and reverse polarity conditions. Compliant to the highest levels of defense quality standards in both the United States and Europe, this module can be used in critical reliability avionics and military power systems worldwide. Intended for harsh environments including severe vibration, shock, and temperature cycling conditions.